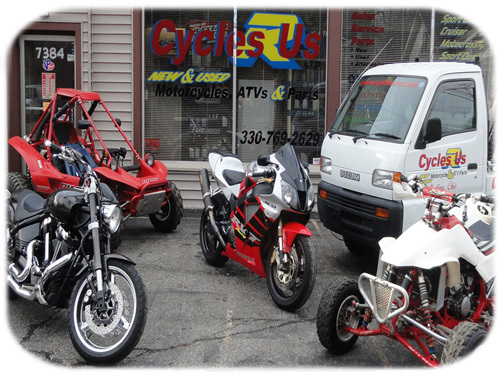 Cycles R Us specializes in New, Used, and Aftermarket Motorcycle, Dirt Bike, and ATV parts & accessories. We have been supplying quality used parts since 1996. We offer a 100% satisfaction guarantee on all of our New & used Motorcycle & ATV parts purchases. Get top quality, correct new & used motorcycle & ATV parts at competitive pricing the first time or your money back! Our parts yard of over 3000 used motorcycles, ATV’s, watercraft's & sleds and our new retail store located only 2 miles apart from each other. 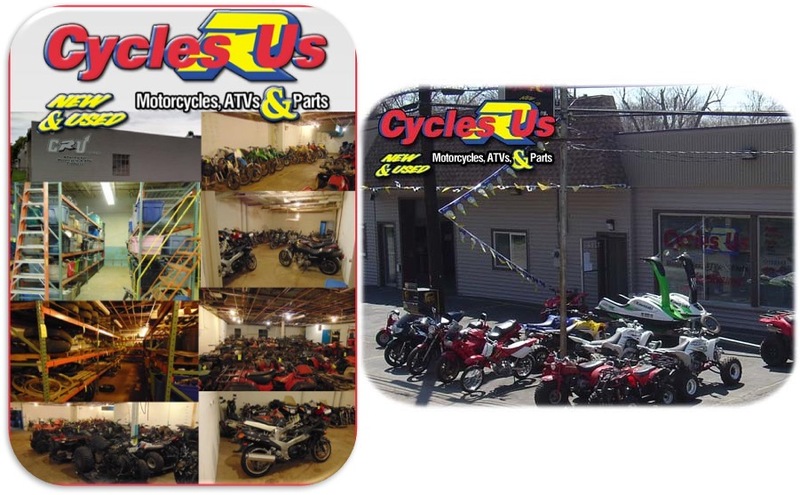 Cycles R Us specializes in used Motorcycle, Dirt Bike and ATV parts. If we don't have your parts in stock we will locate them on our national parts locator network of over 200 salvage yards. We pay cash for junk, burned, wrecked, and abandoned motorcycles. We have every aftermarket (cost cutting) supplier under the sun available to us from oil filters to turbo kits. We carry a large line of rebuilt electrical components including starter motors to charging system components. That all come with a six month warranty all at a fraction of OEM cost. We also offer OEM replacement parts at a discount including Honda, Kawasaki, Yamaha, Suzuki, Polaris. We are an authorized stocking distributor of Pro Armor with products ranging from bumpers, grab parts & nerf bars to protection under plates for ATV’s and UTV’s. We have an “In House” Gasket cutting machine with an inventory of about any paper gasket you could ever want, excluding head gaskets. Just ask! We sell used motorcycles & ATV’s for all ages and sizes. We offer a consignment program to sell your motorcycle or ATV. We have a full service shop that offers cylinder boring, sleeving, & porting. We also offer steel and aluminum welding. CRU Products specializes in high demand aftermarket replacement parts for the Motorcycle & ATV Industry. We pride ourselves in providing top quality aftermarket parts at a fraction of the oem or competition's cost. CRU Products was started by Cycles R Us in 2009. Cycles R Us has been in the salvage business for almost 20 years. Being in the salvage business, we not only see what parts are in a very high demand but what parts are in a very high demand that are costly at the dealership. Distributors & Dealers are welcome.